Terry and Edie in the bar. Summary of the Scene Terry and Edie are in the public bar where Terry orders Edie her first alcoholic drink. Edie starts to. 2 Summary of the Scene Terry and Edie are in the public bar where Terry orders Edie her first alcoholic drink. Edie starts to question Terry about his prize fighting days where Terry opens up about his past life. Terry almost tells Edie about being involved in Joey Doyle's murder. He then tries to cheer Edie up and feels horrible lying to her because he obviously has feelings her. Edie then runs off into a wedding where a fight breaks out and Edie is scared to death but Terry calmly gets her out of the situation safely. Terry offers Edie a piece of gum as a peace offering which she accepts and Terry asks Edie to dance with him. Edie was very intoxicated at this point. While dancing, Terry and Edie almost kiss but are interrupted by Friendly's mob asking for Terry to go and see him at that moment which Terry refuses because he wants to see that Edie gets home safely. At the wedding, Terry is served with a supina for Joey Doyle's murder by the police, insisting that he testify. Edie starts to come to the realisation that there is a connection between Terry and Friendly and she calls Terry a 'bum' as a result. Edie runs out of the bar abruptly and is distraught at this realisation. 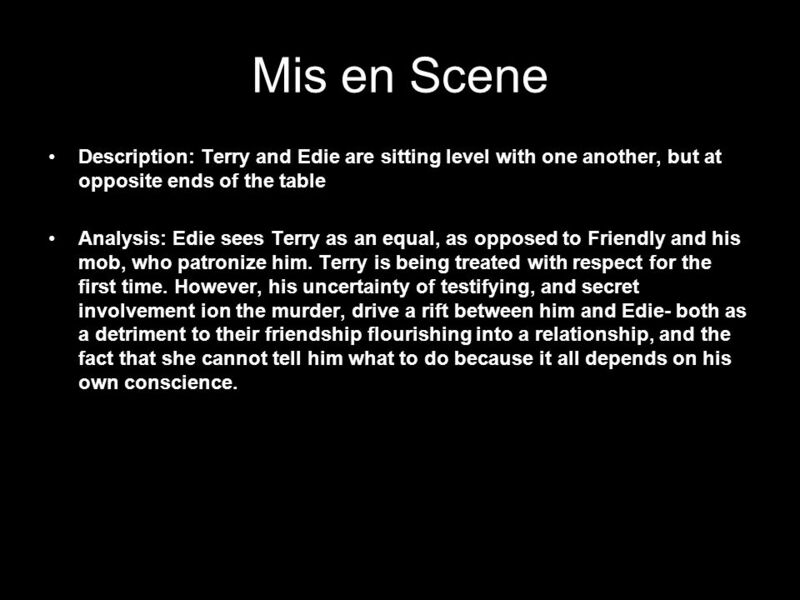 3 Mis en Scene Description: Terry and Edie are sitting level with one another, but at opposite ends of the table Analysis: Edie sees Terry as an equal, as opposed to Friendly and his mob, who patronize him. Terry is being treated with respect for the first time. However, his uncertainty of testifying, and secret involvement ion the murder, drive a rift between him and Edie- both as a detriment to their friendship flourishing into a relationship, and the fact that she cannot tell him what to do because it all depends on his own conscience. 4 Symbolism Description: The party is full of Friendlys connections, pandemonium surrounds Edie and Terry, who are forced into the crowd. 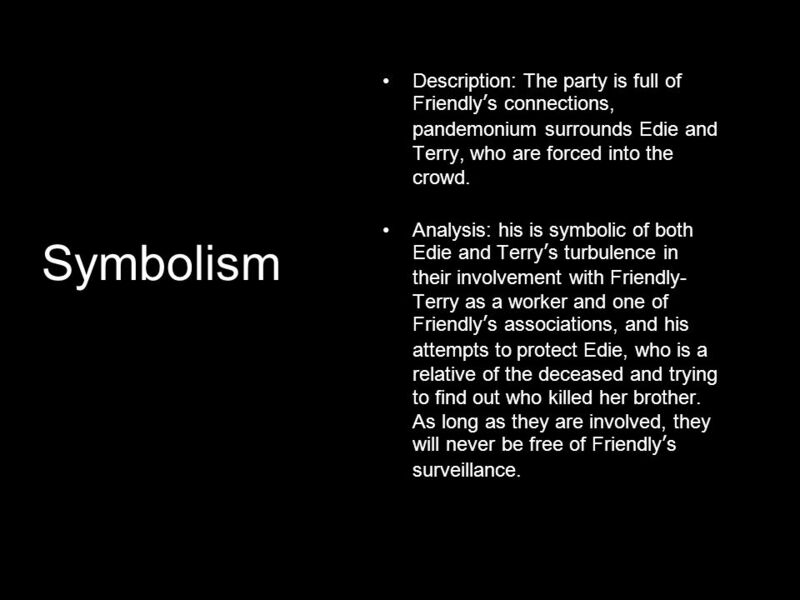 Analysis: his is symbolic of both Edie and Terrys turbulence in their involvement with Friendly- Terry as a worker and one of Friendlys associations, and his attempts to protect Edie, who is a relative of the deceased and trying to find out who killed her brother. As long as they are involved, they will never be free of Friendlys surveillance. 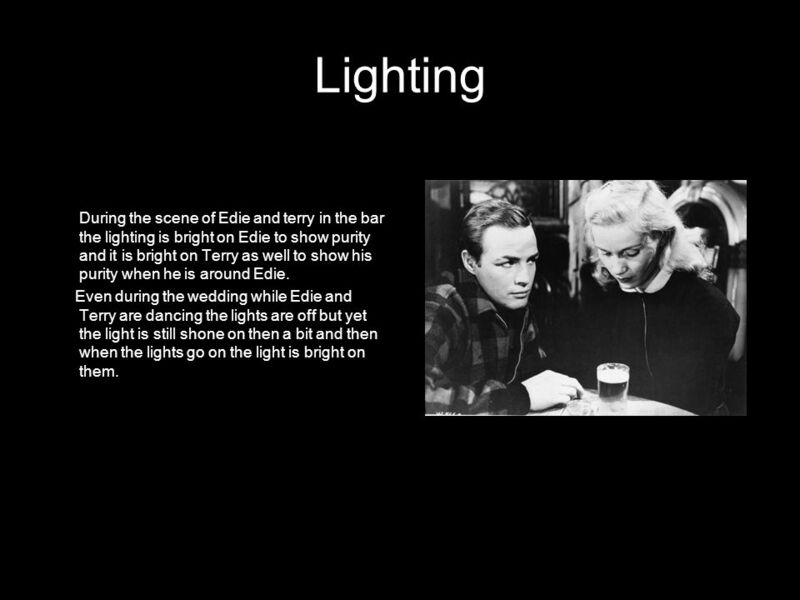 5 Lighting During the scene of Edie and terry in the bar the lighting is bright on Edie to show purity and it is bright on Terry as well to show his purity when he is around Edie. Even during the wedding while Edie and Terry are dancing the lights are off but yet the light is still shone on then a bit and then when the lights go on the light is bright on them. 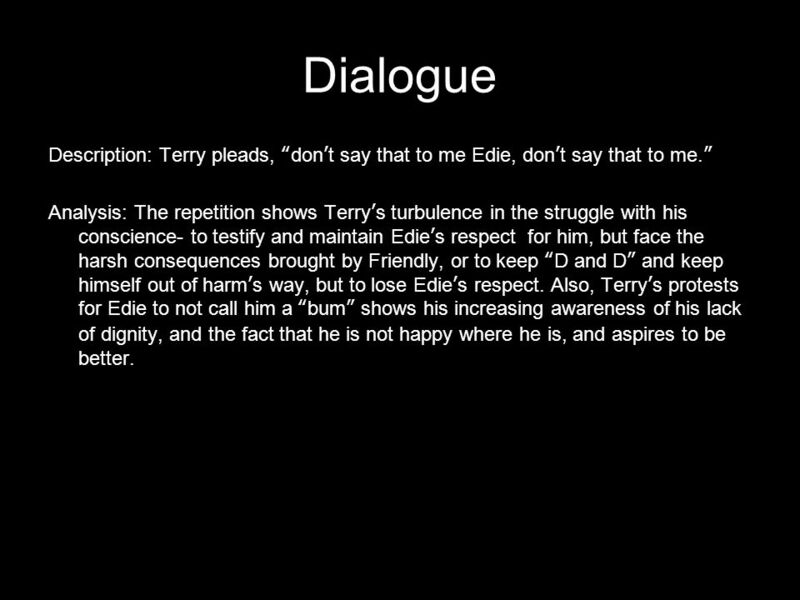 6 Dialogue Description: Terry pleads, dont say that to me Edie, dont say that to me. Analysis: The repetition shows Terrys turbulence in the struggle with his conscience- to testify and maintain Edies respect for him, but face the harsh consequences brought by Friendly, or to keep D and D and keep himself out of harms way, but to lose Edies respect. Also, Terrys protests for Edie to not call him a bum shows his increasing awareness of his lack of dignity, and the fact that he is not happy where he is, and aspires to be better. 7 Music Loud happy music playing while everyone is dancing at the wedding, while Terry and Edie are dancing around in circles. Soft gentle music, when Terry asks Edie if she wants to dance. 8 Camera shots Medium, close ups on Edie and Terry to show their facial expressions and emotion. There are a few close ups when Terry is talking to Edie and he is staring into her eyes passionately. Close up when Edie has a drink for the first time and show her facial expression, showing her reaction after having her first drink and how she feels. Close up on Terrys face when he expresses how he feels for Edie. Extreme close up on Edie when Terry cant even mention joeys name, and Edie gets upset so they extreme close up show you how the character is feeling and their emotion at that time. Close up on Edies face when she is trying to find out what is going on with Terry and why these people want him to go to court. 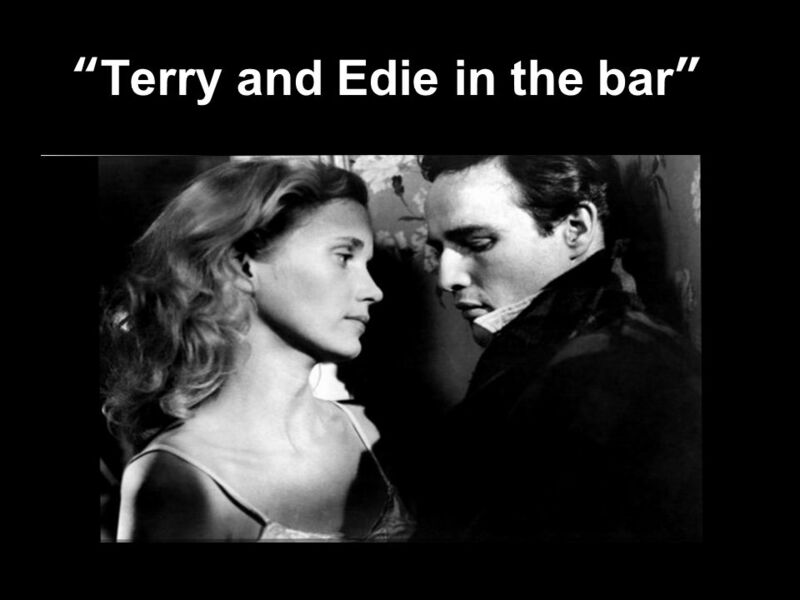 Download ppt "Terry and Edie in the bar. Summary of the Scene Terry and Edie are in the public bar where Terry orders Edie her first alcoholic drink. Edie starts to." On The Waterfront. PLOT Edie and Terry are walking in the park after escaping Johnny Friendlys mob at the church. The location is at New Jersey Park. Social Skills Groups with ASD Teen Boys Joel Shaul, LCSW The Watson Institute. By: Yonathan Andu, Sara Muwaqet,Colby Langan The definition of weddings, funerals, parties, and other social occasions are pretty much common sense. O N THE W ATERFRONT T HEMES. F AITH Comparison of Dugan’s death to “crucifixions” Terry – Christ list figure – blood after his final confrontation Terry’s. Giving and Accepting Negative Criticism May 21, 2007. Gillian Slovo Red Dust Alex Mpondo. MENTAL AND EMOTIONAL DISORDERS -Illnesses that affect a person’s thoughts, feelings and behavior. Possible Causes -Diseases, drug/alcohol use or accidental. Analysis Of Eden Lake. The Trailer In the beginning of the trailer, you can see a car driving down a country. Aspire to Be Well for Undergraduate Students Alcohol and Other Drugs. THECONSENT GAME © Dara Raboy-Picciano, Juan Rosario ©2005. Themes in ‘On the Waterfront’. Acceptance D & D culture provides acceptance for many Terry also finds acceptance in ‘The Golden Warriors’ Edie and Father. Aaron’s Gift by Myron Levoy Review.